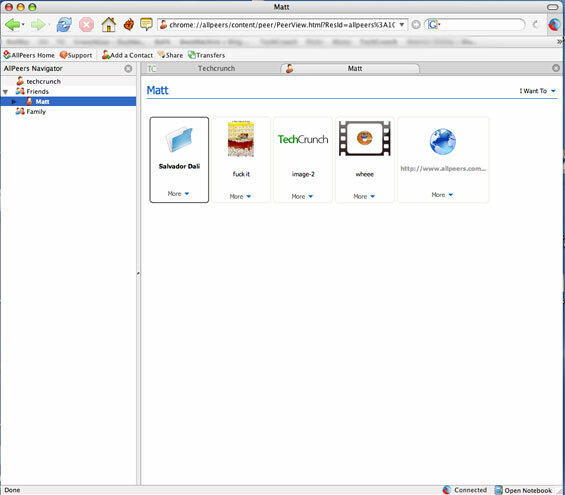 UK/Prague-based AllPeers is a Firefox extension that will allow for group P2P file sharing using the browser. A persistent buddy list in a sidebar is created. Files can be shared with those buddies by dragging a file, folder or URL into their name. It’s just as easy to share the file with multiple people. The core technology is based on bittorent. We’ve followed Allpeers through the initial rumors, first public screenshots and their March venture funding by Mangrove Capital and Index Ventures. They’ve kept quiet recently, saying they’ve been making small changes to their interface and big changes to their infrastructure to handle scaling issues at launch. I’ve been testing the product with co-founder Matthew Gertner – this is going to be a very popular application. Very large (video) files transfered in my tests without difficulty, including after repeatedly shutting down the browser mid-transfer. Like other bittorent clients, the transfer picked back up again after relaunch. The company won’t say when they are launching, but they’ve been bleeding in beta users for a few weeks and the date is clearly not that far away. They’ve also said they’ll allow me to give 50 300 immediate access accounts away immediately – these are first come, first serve in the comments. Just give me the email address you want to use, in the comment. A potential competitor in this space is Zapr, which we recently covered. Zapr is handling file sharing via a stand alone client. AllPeers says they’ll have a non-browser client as well, later this year.